Have you ever tried and tried and tried to teach your dog a trick only to have him repeatedly do it the wrong way? Or not even a trick necessarily, but just basic commands: sit, stay, come, fetch, etc. I’ve always wanted a dog who would fetch a ball and bring it back. With Frasier we are pretty lucky: he can be off leash, stays pretty close by and (usually) comes when we call him. And, he loves to chase balls; it’s bringing them back, that’s not down to perfection. More often than not, he’ll chase the ball like crazy, pick it up when he gets to it and then just drop it where he is and continue on, which ultimately turns me into the fetcher. But today, yes today, today something magical happened. He returned the ball, very close to me. Well, three times very close to me and twice in the bush near by. But still, this is a big improvement on his track record. And what was the secret to our success? Dog biscuits? No. My command of the dog? No. Pure luck? I don’t think so. It was the Little Niko Man! Yup, the three of us headed to the park and I lay out a blanket in the shade, for Niko with some toys for him to play with. Seeing as Little N was on the ground, I really couldn’t go after the dog to get the ball back, so I just stayed put and this is how it worked. Picture Frasier running full blast toward the ball and then running (almost) full blast back with it. And oh oh, heading straight for the baby! Hope this turns out OK. But then he just dropped the ball at the edge of the blanket and waited for me to throw it again. It was one of those times I wished I had my camera but didn’t. Maybe I’ll stage the shot again later, and insert the picture after the fact. I was so impressed with Frasier, and with Niko, who turned out to be the dark horse, my very own miniature Dog Whisperer. Poor little Sophie almost suffered her demise today. Thank goodness all she actually suffered was some slobber, and she’s used to slobber, just not the canine variety, per se. I was walking through my living room when I spotted her utterly alone and all nestled in on Frasier’s humongous dog pillow, with the telltale sign of fur by her feet. I know Sophie’s popular but didn’t realize what a temptation she was for our pooch. We’ll have to be careful where we put her next time. 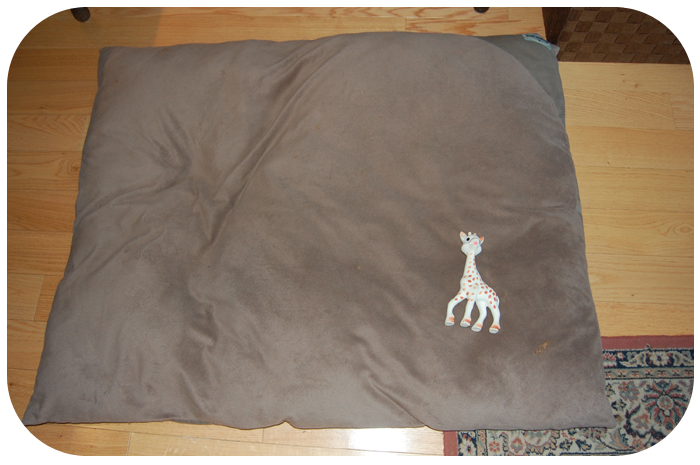 Niko wouldn’t be happy if he lost his beloved little giraffe to the jaws of his huge poodle. 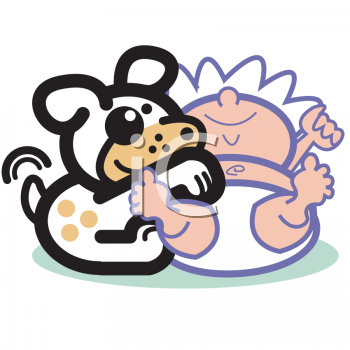 How to integrate a puppy and a newborn? This question had been floating around in our minds since we adopted Frasier last April. When we got Frasier we knew we were expecting a baby in October, but seeing as we I really wanted a dog, we thought getting a pup before the baby was born would be a good idea as it would give us time to train him. So fine, one day I went out to get the pup and then the training and fun began. Once we brought Niko home from the hospital, our philosophy was integration: Frasier wouldn’t be excluded from our family, just because he has four legs, a crazy tail and a spunky personality. I mean overall he is actually quite predictable, and although I don’t think you can ever trust a four legged friend 100% around a child, over the last few months our trust factor has risen considerably. 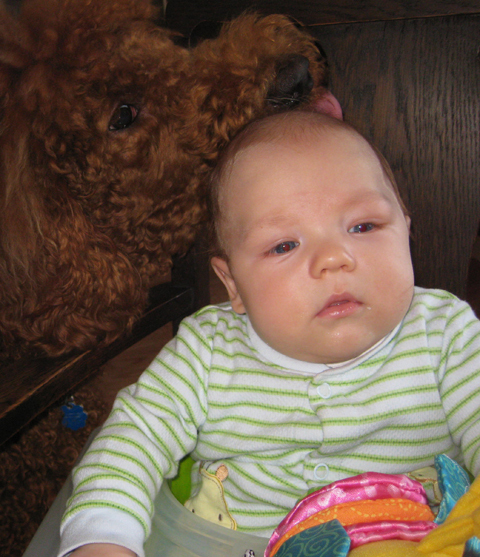 Frasier mostly shows signs of curiosity towards Niko, giving him lots of puppy love and kisses. 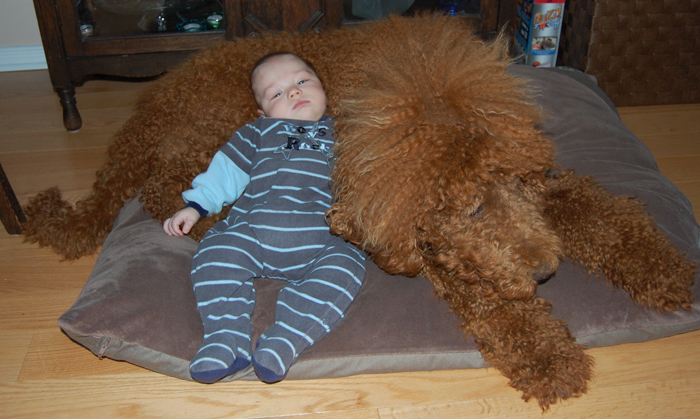 So much so, that I think we may have found a permanent babysitter for our little guy. 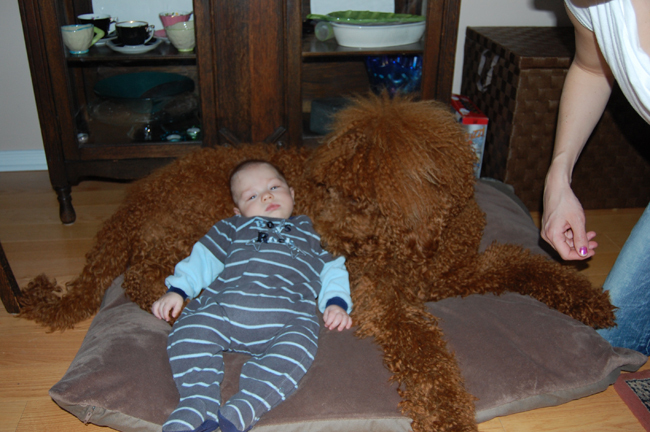 Borys and I often wonder who we will get to babysit Niko when the time comes? Now, I think we may have found a solution. And who is this new sitter? Frasier, of course! 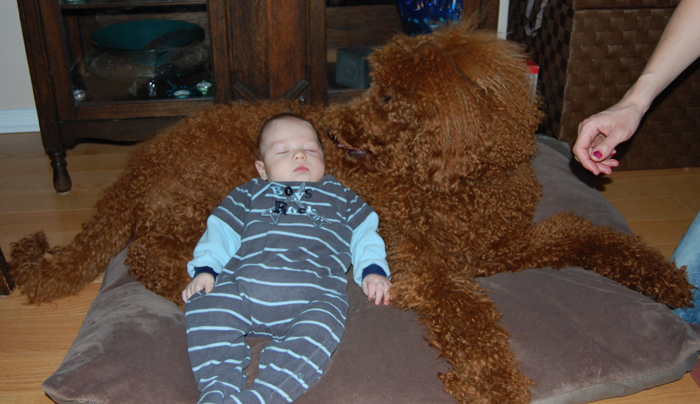 Just look how well Frasier is tolerating the little guy snuggling right in to him. I am sure with a few short tutorials on diapers and feeding, he would catch on and be able to take care of Niko, no problem. 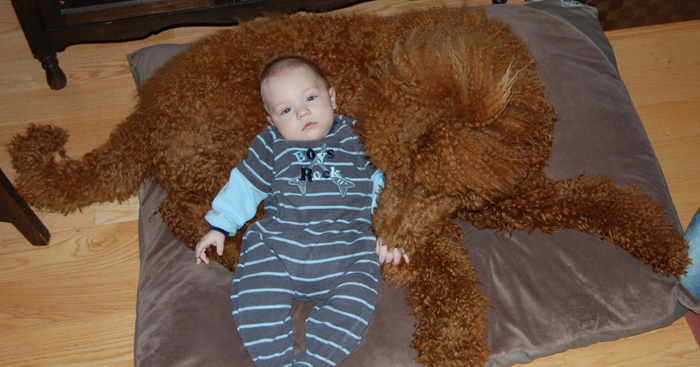 After all, poodles are one of the smartest breeds, and his rates would have to be affordable considering we already supply his room and board! And presto, baby N is sawing logs! Easy peasy. Frasier’s a natural! Let the babysitting begin. Note: Pay no attention to the random hand in the right of the photos. It in no way signifies a lack of trust for the dog or any sort of feeling that these kisses may turn into love nips and then in fact have to be quickly nipped in the bud – no it does not signify that at all! It seems that Frasier has taken a liking (at least that’s the light I’m going to shine on it – after all it couldn’t be jealousy, no not jealousy) to his little pal Niko. Upon bringing Niko home we were a little concerned about how Frasier would respond. I mean up until then Frasier had been the numero uno, the head honcho, the guy running the show and the one that we devoted all our time and love toward. But then Niko came along and Frasier was forced to take second place. Even though he’d been bumped to second rank we still wanted him to feel loved and a part of the family – we figured we had to allow him at least to be near the baby as Niko had become a permanent member of our family and how could Frasier not be a part of that? This took a bit of trust on our part, but really Frasier has never given us any (major) reason not to trust him. 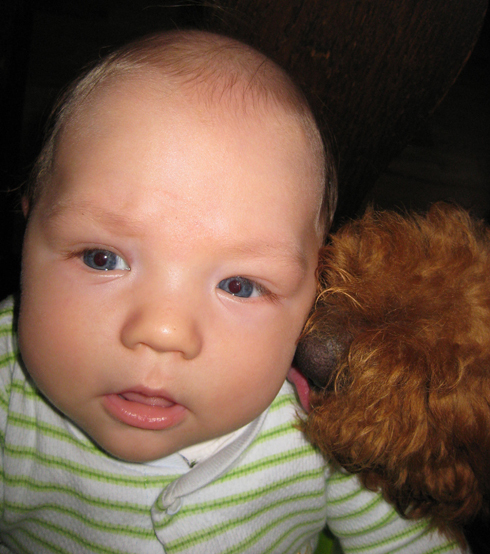 So, we allowed him to sniff Niko and give him the occasional kiss – under supervision of course! Yesterday I caught Frasier in his loving actions on camera, and while the look on Niko’s face may not be one of utter love, in dog speak that pink tongue stuck to Niko’s head says: “I love you little friend!”.